We recently spoke with Yener Kandogan about the University of Michigan-Flint's Net+ MBA. A majority of our students are working professionals. They are pursuing their MBA with the goal of moving up within their organization or within their current industry. Please describe how UM Flint students work together: in a cohort or group projects? Our MBA program emphasizes teamwork, and our students work in group projects in all of our courses. The online teaching platform we use, Blackboard, facilitates group communication and file exchanges through many options, including video conferencing. During the weekend campus sessions, the students also meet in person to finalize their group projects. UM-Flint offers several course modes: Net+, Evening and Online. Please describe the Net+ program—is it anagolous with a blended or hybrid MBA? Yes, the Net+ MBA is a hybrid or blended online format. We have been teaching MBA courses in this format since 2001 and we are one of the very first MBA programs to do so. Our students will complete 60% of their course online with the other 40% making up two weekend campus sessions each semester. UM-Flint offers multiple centers and hubs, including Hagerman Center for Entrepreneurship and Innovation. Are MBA students able to connect with this hub or others (ie. The Financial Lab, Michigan Family Business Center, Michigan Center for Entrepreneurship Leadership) during their studies? All of our hubs and centers are available to all of our students, both graduate and undergraduate. Our MBA students have been actively participating in these centers’ activities. They add to the value of the Michigan degree. What is unique about the structure of University of Michigan-Flint’s online MBA program? The Net+ MBA offers the flexibility many students require in their busy personal and professional lives while still offering the classroom interactions twice each semester. The classroom interaction allows for networking opportunities not found in 100% online MBAs. 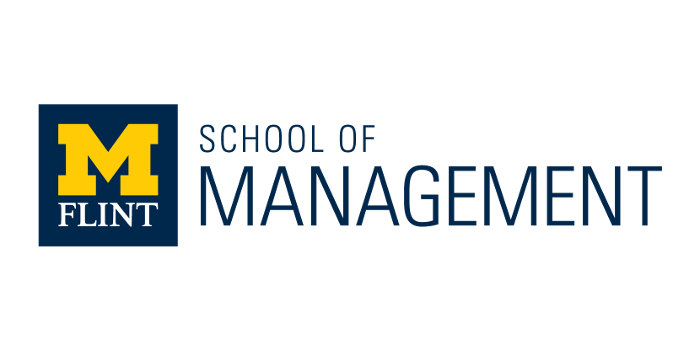 The School of Management has a dedicated career services representative that works with all business students. Most of our MBAs are set in their careers; but for those younger MBA or career changers, we have the resources to make sure they have the opportunities they are seeking after graduation. UM-Flint offers dual degrees (ie, MBA/MSA in Accounting). Are these programs offered via Net+ and Online delivery and do many students earn a dual degree? Dual degrees are great because it allows students to earn a second graduate degree by counting courses they have taken in the MBA toward their second degree, saving both time and money. About 5% of our students entering the MBA program will elect a dual degree and that number will increase to about 15% of MBA students by the time they graduate. The six dual degrees that we offer are a mix of Net+ and online. With journal publications, the school’s MBA faculty significantly contribute intellectually to both basic and applied scholarship. In the last five years, several of the peer-reviewed publications appeared in top business journals. Our MBA faculty also gave several invited speeches at various research workshops at leading universities in the US, Europe and Asia. Several MBA faculty are also faculty associates at major research centers. Among our faculty, have multiple Fulbright scholar, and many were recognized for their intellectual contributions by receiving best paper awards, journal editor commendations, ranked in top 10% in their fields, or selected as emerging scholars. Our faculty’s intellectual contributions also had significant impact on the practice and national and local business community. These include faculty’s professional articles that appeared in several leading national and local publications. A finance faculty’s blog on economic, finance and public policy issues attracts more than 3 million visitors annually. Our faculty has also been affecting national policy formulation with expert presentations. On a local level, our faculty are involved with regional business development with presentations, promoting entrepreneurship and mentor student business plans. Lastly, our faculty provided many consulting and service on boards during 2013-17, from large corporations to small businesses, charities, NGOs, and foundations. GM, Ford, Toyota, Domino’s, State of Michigan and many more. Be sure you are well organized. Create a schedule for yourself and stick with it. Balancing your professional career, personal life and graduate schools isn’t the easy thing to do, so be sure you are ready to work hard. Take advantage of the networking opportunities in your MBA; those networks will last the rest of your career. Why should a prospective MBA candidate choose University of Michigan-Flint? The University of Michigan-Flint MBA offer a great return on investment; students earn their Michigan MBA at a great tuition rate. The flexibility is second to none with our hybrid format; and it allows students to build their network in person, which is extremely valuable. Thanks to Yener Kandogan for participating. For more interviews, check out our Online MBA Report Interview Series.